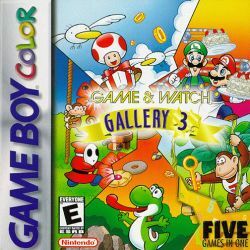 Game & Watch Gallery 3 is the third instalment of the Game & Watch Gallery series. It was released in 1999 for the Game Boy Color. Egg: Yoshi must eat cookies as they pop out of the oven. In the original, the player controls a fox who must grab falling eggs laid by hens before they hit the ground. Greenhouse: Yoshi must protect his plants from Shyguys and monkeys by spitting watermelon seeds machine gun-style. Turtle Bridge: Toad must relay packages between Mario and Peach by using a bridge of Goonie Birds, who keep diving away at balloons that float by. In the original version, the players crossed a bridge made of turtles. Mario Bros.: Far different from the Mario Bros. arcade title, this game has Mario and Luigi scurrying around to keep a series of cakes moving on a conveyor belt. Players control both Mario and Luigi with different buttons in both versions of the game. Donkey Kong Jr.: Also different from the arcade title of the same name, this game has players controlling Donkey Kong Jr. through various stages toward his father, who is trapped in a cage. These games can only be played in their original form. Fire: A reversed version of the Silver Series version.